Send your greetings for your friend's baby boy's first birthday through these free printable cards. These printable birthday cards feature a baby boy holding balloons plus more birthday elements like confetti and of course a big cake! 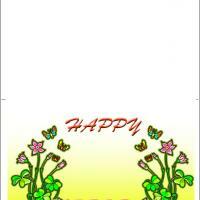 Print this and write your warm wishes inside. Help your friend or family celebrate that first special birthday of their little boy without breaking the bank to do it. Each card can be set up easily to include an image chosen from our large selection and you may add your own personal words too. This card will be treasured long after the baby has grown up and left the nest. Few things in life are more special than celebrating the first birthday of our children. 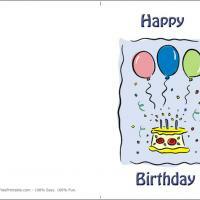 Baby Boy's 1st Birthday Today card is one of many fun cards from these free printable birthday cards. Balloons? Check! Party hat? Check! Birthday cake with one lit candle? Check! All this and one smiling little boy make this card a keepsake for the baby book. Furthermore, you absolutely will a love our easy custom print feature to include those personal words you so want to share to let them know you care and want to celebrate with the parents on a wonderful milestone day. Wow! A first birthday! That certainly calls for a special card. 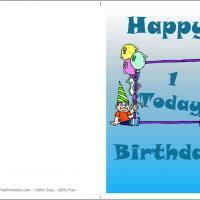 Baby Boy's 1st Birthday Today card is one of many fun cards from these free printable birthday cards. The cover is decorated just perfect with balloons and a cake with the one lit candle. 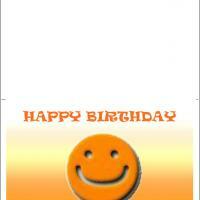 Our top quality designed cards all offer a free customizing feature. That way you can share your wishes for the little boy when he blows out his candle. With a click or two you can make the front cover have their name included. 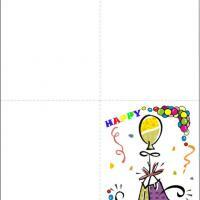 And, clip art can easily be added before you print these cards at home. Make a keepsake card today!